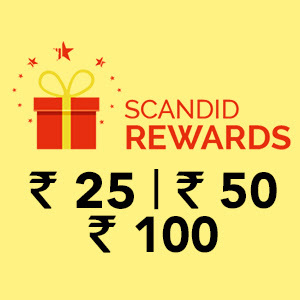 Hello Dealsnloot Raeders,As a Scandid App user, you can avail Scandid Rewards for making a purchase from five retailers listed on Scandid App. These retailers are- Flipkart, Snapdeal, Paytm, Amazon and ShopClues.Shop On This Sites Using Scandid App and Get unlimited Flipkart Gifts Card Rs. 25, 50 & 100 on Millions of Products.So Grab This Loot Deals To Shop Using Scandid App. You Done.You Receive Your Scandid Reward in 40 to 60 Days. Once your transaction is successfully tracked and verified by us which usually takes 40-60 days from the date of purchase. Snapdeal, Paytm, Amazon and ShopClues can track and verify sales only if you transact on their mobile site. make sure you transact on the Mobile site for these stores.